In the next few weeks you should expect more than two updates per week, as we’d like to keep everyone as updated on the games’ progress and also seize the opportunity to peak newcomers’ interests as we cross the mid-way point of our campaign. To celebrate the half-way mark, we’re hosting a special 2 hour live show featuring visits from two very special people. Voice of Ravensdales’s “Captain”, Mark Meer, and drummer of the band behind the music of Ravensdale, Specki T.D will be dropping in via Skype to say hello and answer some questions provided by you guys. If you’ve got any you’d like to ask, let us know here in the comments or post them in the live stream chat. On Wednesday the 31st we’ll be releasing our first video diary from In Extremo, with some footage from their pre-release listening session for their new album “Kunstraub” and some short videos sent in by Specki who is currently vacationing in California. 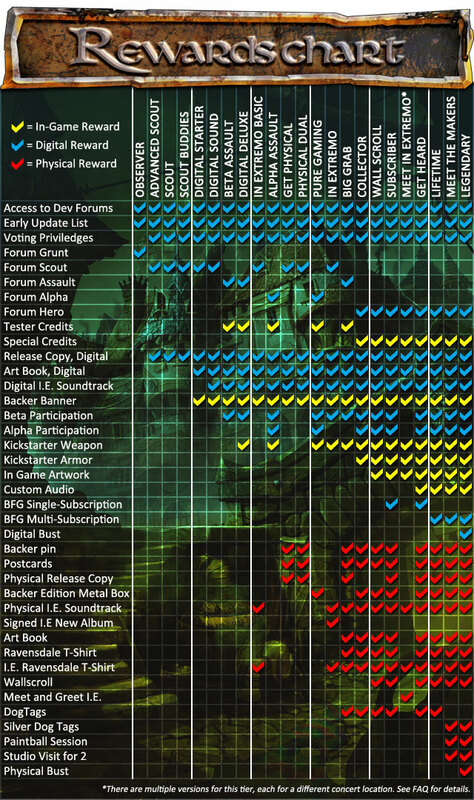 In the meantime, we have provided a handy reward-chart so people can more easily track what they actually get when they pledge at certain reward levels. The chart is featured on the main page and you can also find it here. Additionally, we’d like to remind you that you can adjust your pledge manually to add different items to your pledge level. This way, you can customize what you actually want to get if you don’t feel like grabbing it all. Short and to the point this time. We've also updated the event calendar, so you can stay on top of what's going on with a visual representation. Expect more throughout the week! Stay tuned gooplings! If you haven’t heard about our news about Linux, please feel free to scroll down to read the update along with the most asked questions about porting our games to Linux. This week we were happy to announce Mark Meer voicing The Captain in Ravensdale, and we’ll have some concept art of his character fairly soon for you to look at. We also let you in on the current design of the game with our team spotlight, which focused on three important members of the design team. Wednesday, July 31st: In Extremo Video Diary. We hung out with In Extremo at the pre-listening session of their new album Kunstraub that releases September 27th, and captured some messages from the members. Also, we’ve got some video greetings from Specki who is currently vacationing in California, and bringing with him the word of Ravensdale. Thursday, August 1st @ 9pm CET: Mid-Way live show special with Mark Meer. Our special guest will be joining us for about an hour to say hello and answer some fan questions from the community, if you have a question for either, let us know in the comments! Twitch.tv/blackforestgames More updates on the live show special to come! We hope to see you during the live show, and remember you can always visit the dev team in the developer forums. To gain access to the development forums, send us an e-mail at forum@bfgames.biz and include “Development Forum Access” in the subject line (caps sensitive) along with your kickstarter username and pledge level. I know this is not the regular update day, but it’s a special exception. We are happy to let you know that after our initial release on PC we plan to port Ravensdale to Linux! Understandably, you probably have some questions about that, so we’ve taken the four most asked questions from the Linux and Mac communities and answered them below. 1. How do you know you will be able to port to Linux this early in development? We're essentially done with our main ports, which means that the core engine development is already in place now. In fact we've already done a first initial port of our engine to Linux earlier in the year, so we're already nearly there for doing a game port to Linux. 2. Why can you port to Linux so easily with Ravensdale but not with Giana? As mentioned in the previous answer, we now have spent a large portion of time to get our technology working on Linux, time that we didn’t have after we kickstarted Giana. The time we did have back then, had to be spent on porting to the most major platforms. So, in essence it was mostly a time issue where we didn't have the capacity to do multiple ports simultaneously. Hence the console ports for the game coming out later separately from each other as well. 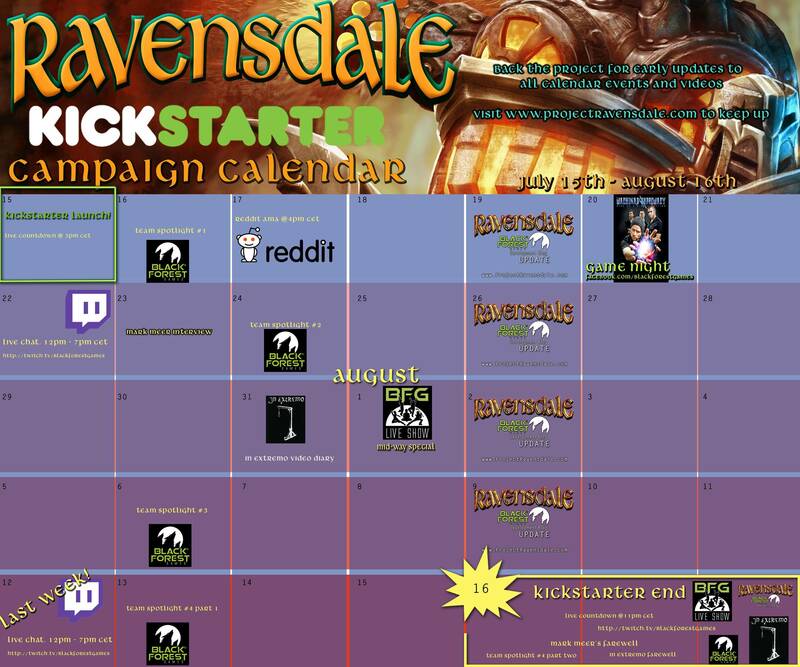 The Giana Kickstarter was at the projects end, with Ravensdale we have much more time to dedicate to more platforms than just the big three. We released Giana 1 month after it was Kickstarted, this time we have almost a year to prepare for ports. 3. Will Giana ever get a Linux or Mac version? Yes. Though we can't say specifically when we’d be able to do the ports, we do want it to happen. 4.Will there be a mac version for Ravensdale? We don't see a reason not to! We aren't sure exactly when it will happen however, when we decide when the port will take place, we will make sure everyone knows about it. We hope that eases some speculation from Linux and Mac users in our communities. We want as many people as possible to be able to enjoy our games, that’s the whole point of making them! We would love it if our games were on every platform. Stomping owls with Occulus Rift? Sign me up! There were significant issues preventing us from porting our games to these platforms in the past that are becoming less and less, so we are happy to be able to start the process with Ravensdale. Lots more news coming your way in tomorrow’s update so stay tuned! This week has been a mixture of nerves and nostalgia, even though we no longer have to put the drinking bird on our f5 keys this time around, the need for updates and inability to peel ourselves away from the pledge count is all too familiar. It’s not clear yet whether the kickstarter update Android/Iphone widget is a good thing or a bad thing yet, but oh well, we’re hooked up to the Kickstarter IV for the next 4 weeks anyway. -	You have already released Giana Sisters, shouldn’t you be using the revenue from that to make your next game? -	The answer is yes, and we are. The problem with that is there wasn’t enough revenue to fund an entire new project from scratch. Remember, last year we kick-finished, Giana was almost complete when we started out campaign, this time it’s a brand new game from the bottom up and 500,000K is what we need to make it in addition to the Giana revenue that has enabled us to produce what you’ve seen so far. Every penny from Kickstarter goes into building the game, from our office rent, to salaries, to assets. Going Kickstarter isn’t easy, it’s nothing like going to a bank and getting loan, but the benefits of community publishing are far greater than the convenience of a bank loan of publisher funding. Last week we also released the first installment of our Spotlight series. Every week we take a look behind the scenes at BFG and Ravensdale development, this week it was our 2d and 3d art departments, and next week we’ll take a look at Game Design. Remember to keep an eye on our campaign calendar for when the videos will release, as well as other important events throughout the campaign. Later in the campaign, we will also release exclusive In Extremo spotlights! - Double Packs! Ravensdale is a co-op game, so it is only logical to get it for more than one person! We are offering both the digital and the physical game in duo packs now in a limited quantity! - In Extremo Tiers! The guys from In Extremo have provided us with a host of goodies for fans! Check out this awesome stuff (some of it limited, so get it while it is hot!)! There is also a selection of new rewards on the front page of our Kickstarter project now. These are, of course, not completely final and more will be added as the campaign progresses and will eventually presented in a nice, big bundle, but we figured you would like to see what you get! Saturday, July 20th – Game night with Machinae Supremacy: For those of you who are new to our community, Machinae Supremacy crafted the heavy metal version of the Giana Sisters: Twisted Dreams soundtrack that was created alongside Chris Huelsbeck last year. They are a really fun, great group of guys that are maybe a little too prepared to frag us this Saturday at 6pm CET on Unreal Tournament 1999. We host the servers, you sign on, we all shoot at each other. For more details visit the facebook event or check out our dev blog. Monday, July 22nd: BACKER EXCLUSIVE SPECIAL GUEST VOICE ACTOR ANNOUNCEMENT: If you haven’t backed the project and want to know who we’ll be adding to our team as of Monday, you’ll have to wait a little longer to get the details! Monday’s update will be backer exclusive, after posting a special interview with the voice actor who will be joining us in our development forums we will post it again as a kickstarter update for backers only. Tuesday, July 23rd: Special guest voice actor Interview goes public. Stay tuned to our social media channels and dev blog to find out who it is and spread the word with us! Wednesday, July 24th: Team spotlight #2. A behind the scenes look at our game design department. Like all special announcements, the exclusive interview with our new team member will be posted in the developer forums. Every backer at the $5 tier and higher has the ability to gain access to the forums. To gain access to the development forums, send us an e-mail at forum@bfgames.biz and include “Development Forum Access” in the subject line (caps sensitive) along with your kickstarter username and pledge level. Lastly, our friends at Last Limb LLC are also Kickstarting this month! http://www.kickstarter.com/projects/1168870049/organic-panic-a-physics-puzzler-where-you-build-th?ref=live Worms meets Little Big Planet, you know how much we love puzzles and destructible levels, so we think you might too. That’s all for now, stay crazy my friends.